The Fruit Sensation ™ season has started, fill your pockets with the right crops and reap your profits. The glowing fruit is ripe and cannot wait to be picked. The Magic 7 adds greatly to your winnings. Enough waiting, simply try it out! 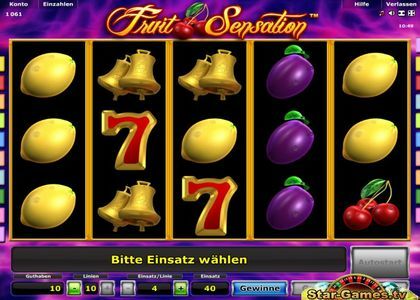 To win Fruit Sensation ™ all five reels need to show a winning combination. The winning combinations are listed in the prize table in the slot. Each winning pattern is read from the leftmost reel along the pay line to the right. The “Gamble” button appears whenever a winning combination of at least three symbols in a row appears starting from the leftmost reel. “Gamble” could help you double your winnings. Simply click on Gamble to take advantage of this option. When you do not want to play with your winnings click on “Cash out” and the amount is directly credited to your balance. Clicking the button “Winnings” provides you with an earnings overview. Your winning potential is also automatically calculated according to the betting amount. In addition to the regular profits you also have a chance at winning a jackpot. This is a progressive jackpot, where the value of the jackpot increases a little with every spin made by not just you, but all Fruit Sensation™ players.